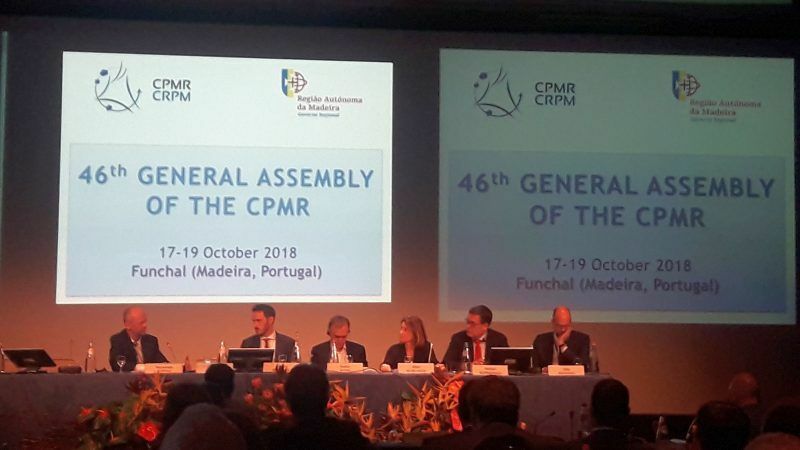 Europe’s regions are in urgent need of concrete measures to boost their local economy and their European dimension, stakeholders highlighted during the General Assembly of the Conference of Peripheral Maritime Regions (CPMR) in Madeira, Portugal on Thursday (October 18). “Cohesion Policy needs to include regions as motors of growth” stressed Eleni Marianou, Secretary General of the CPMR. “We need an ambitious budget, a budget that consolidates”, Vasco Cordeiro, president of the CPMR and president of the government of the Azores, highlighted during his speech. Climate change, unemployment and demographic changes are among the emerging challenges. Still, the Commission’s proposal for Cohesion beyond 2020 does not take these challenges into enough consideration, Miguel Albuquerque, president of the regional government of Madeira, told the opening session. This choice could force regions to double their efforts in order to keep up with the next priorities, he explained. For European stakeholders and regions, reaching a deal on the final Cohesion framework is of outmost importance, as it will define also the further positions that member states, regions and respective managing authorities will adopt from then on. Robert Zischg, Austria’s ambassador in Lisbon, underlined that, as Europe now faces multiple and complex issues both from the inside and the outside, immediate actions are necessary, with security being one of the most important goals. The EU needs to produce results, and it needs to produce them through common solutions, he highlighted. In any case, there should be enough room for the regions to react and develop, he added. “Europe needs to unite and react as a whole. Its strength is its big unity”, stressed also Pedro Marques, Portuguese minister for planning and infrastructure. One of the regions’ main concerns, is the Commission’s proposal to remove maritime cooperation from cross-border co-operation in the period beyond 2020. Filip Reinhag, deputy mayor, Region Gotland argued that this could have a devastating effect on islands. Normunds Popens from DG REGIO, defended the Commission’s position, highlighting that maritime cooperation will function more efficiently in the context of a bigger and more inclusive programme. “It is not about abandoning the maritime regions, but to me, there is no logic in having a cross-border programme in the ocean”, he said. “We are not against it but we want it to be more efficient, more logical… It is about finding the balance between keeping the locality of these programs and streamlining the implementation”, he added. His words sparked tension in the room, with stakeholders stressing that this aproach does not really address the true needs and strengths of the regions, especially the ones that depend from maritime cooperation and the respective programmes. The debate on the fate of maritime co-operation is a crucial one, as it is also linked with the debate on the final structure of INTERREG, the EU’s territorial cooperation programme, whose budget is also reduced in the next Cohesion framework. Networks of regions and cities seem to have a firm position on this and a further discussion with the Commission is still needed before the final decision is made.